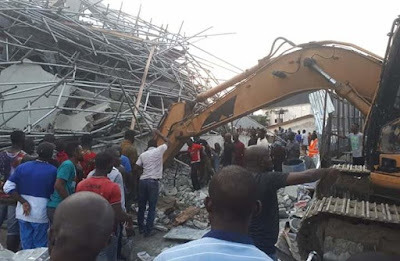 A seven story building under construction has collapsed in Port Harcourt, the Rivers State capital. The building which collapsed around 7pm had several persons suspected to be workers trapped under the rubbles. The Rivers State Government who confirmed the story in a statement by the State Commissioner for Information and Communications, Emma Okah said some persons have been rescued alive. He said, “I can confirm that a multiple story building under construction at Woji Road, GRA Phase 2 (opposite De Planet Lounge), Port Harcourt, Rivers State, has collapsed”. Confirming the incident, Rivers State Police command Spokesman Nnamdi Omoni said no dead body had been gotten from the collapsed building. He said, “It is true that a seven story building under construction collapsed at the GRA area of Port Harcourt. The police and other security agencies have taken over the place to forestall any breakdown of law at the area”. “we cannot ascertain at this point if those still under the collapsed building are dead, but our men have taken over the place to ensure everyone trapped under the building were rescued alive. “For now, it is too early to predict or how many persons are dead since the rescue operation is still on going. We will release further details when the operation is over. However, details of the project, including the owner and what the structure was meant to serve is yet to be ascertained.